This Mother's Day, Casa Italia has a special treat, not only for mothers, but for everyone who has a sweet tooth. Satisfy your gelato craving through a wide spectrum of premium flavors that can only be found in Casa Italia. Handcrafted with only the freshest ingredients, their vast gelato creations are certain to lure even the most discerning patron. And the best part? You get to enjoy two cups for the price of 1. Yes, just for this Mother's Day weekend, Casa Italia is offering a buy 1 take 1 promo on all gelato flavors! But Casa Italia is not just about the gelato. Their kitchen cooks up a wide array of dishes which families can feast on this Mother's Day. Get your share of their generous portions of Ribs and Chicken Platter or take a hefty bite off their Beef Pot Roast. And for sharing, you may partake of the Truffle Mushroom or Parma Peach Pizza. For Pasta lovers, there’s the renowned Pasta A La Bolognese and, for the more adventurous, the new Salted Egg Pasta. 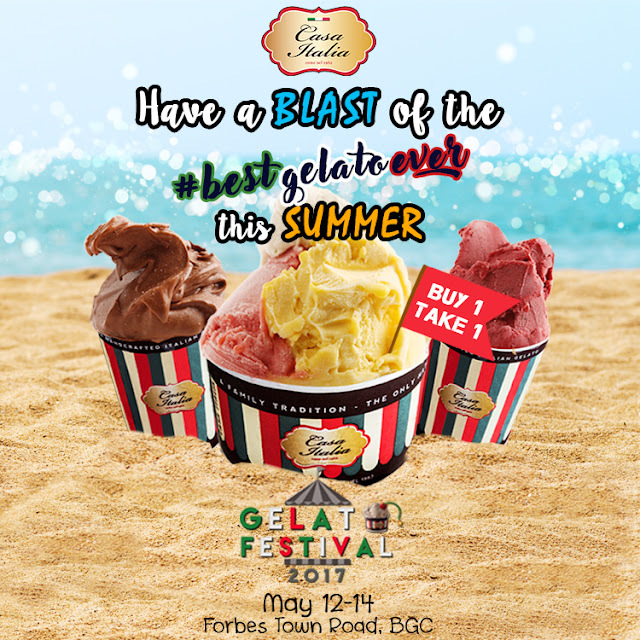 So head on over to Casa Italia this Mother’s Day Weekend for the best gelato deal PLUS a complete fix on authentic Italian cuisine! Visit any of their stores located at the Forbes Town Road, BGC or at the G/F, The Block, SM North EDSA.